When is it safe to begin back carrying with a sling? This is one of the most frequent questions I am asked and I usually answer with more questions, as there is no one single answer! Children have been carried on their parent’s backs since the dawn of the human race, because it is a simple and convenient way to carry a child around as you get on with daily life. Families in different cultures from our own tend to share parenting skills and knowledge within the community, so there needs to be no formal teaching, it is just what has always been done and everyone learns how to do it from observation and previous experience (siblings often carry new babies). Babies in traditional families are back carried in pieces of cloth from a very young age without any fuss. It is normal behaviour, and allows meals to be prepared and water to be collected while baby sleeps peacefully in a safe place. This is a very different way of doing things than in our Western culture, where we have lost much of the communal family life we once had, and parenting skills are no longer passed on in the same way. These days, we need to learn about how to care for our newborns from other sources than our local neighbours; we create virtual villages with social media, rely on organised groups of mums and look on the internet for information about feeding and sleeping. 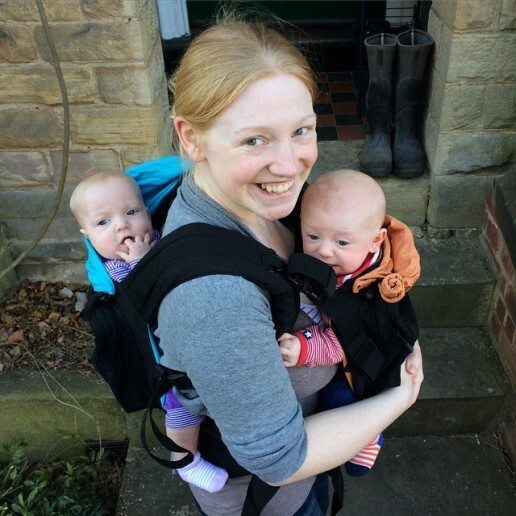 Carrying methods are just the same; infants are not routinely carried in slings and thus we need to ask for advice. 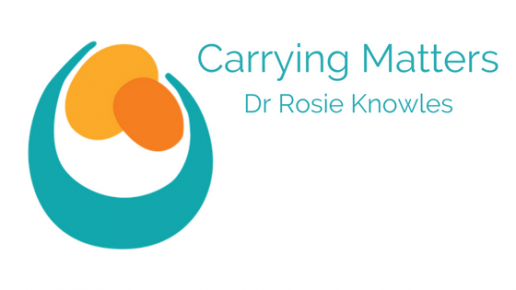 This is where sling libraries and consultants are so useful; they are parents who have discovered carrying skills for themselves, honed and practised these skills, and wish to share their expertise with other parents so that carrying can be promoted – carrying children matters. Front carrying is the most common position for young babies; central or slightly off centre, as this mimics natural in-arms carrying that babies enjoy so much. The closeness and sight of your newborn promotes oxytocin release (vital in attachment) and adds a measure of confidence for you, being able to see any changes in breathing patterns and allow quick and easy rearrangements if needed). Back carrying can be a particularly contentious issue in Western culture; nobody seems sure what the “rules” are and lots of different advice can be given out. 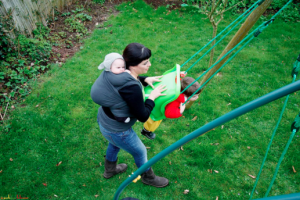 Back carrying can be done from almost any age, with appropriate care and caution for protection of airway and spine, and with the appropriate sling to facilitate this safe positioning (see the position image). Quite often, parents who have learned how to back carry older children will feel more ready to begin this with their new babies at an early stage, if they want. However, you can learn to carry your first baby on your back and there will be support from professionals if you need it – it can make a big difference, having a guiding hand as it can be scary! The more confident you are with handling your baby and your carrier, the easier it will be. Not every type of sling is suitable for back carrying. For example, while some buckle carriers do carry newborns very safely on the front, they are usually snug and high up on the chest (close enough to kiss) and any changes in airway position can be quickly seen and corrected. It is much harder to monitor your newborn baby in the same buckle carrier on your back (which will usually end up quite low) and to be sure that your baby is properly supported inside the panel without any slumping over or chin sinking onto the chest. (This is due to their immaturity and greater muscle fatiguability even when they have some head control). Most buckle carrier manufacturers will state their minimum age for using on the back and it is wise to respect this. Some stretchy wraps can be used for back carries (see here for more) if they are designed to do so and have been appropriately tested. It is a common myth that you should never use a stretchy for a back carry, however they can be very hard to do well. It requires skill and this is best learned from someone who knows how to do it, for safety. Some people will choose to use a different carrier that they find easier or more convenient. Let’s look at some common questions around back carrying. Can I carry my newborn baby on my back? 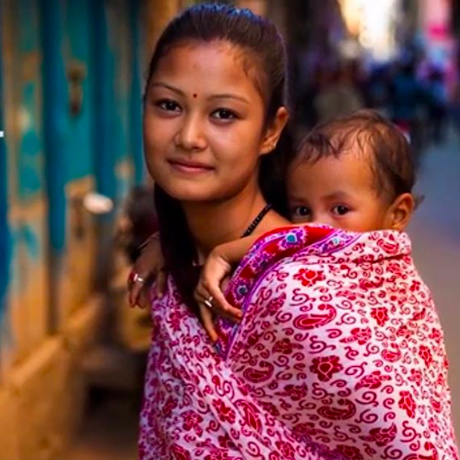 Yes, newborns can indeed be carried safely and comfortably. They will need frequent feeding and changing, but many will settle happily to sleep in a back carry. The safest way to do this is usually with a soft and floppy woven wrap. 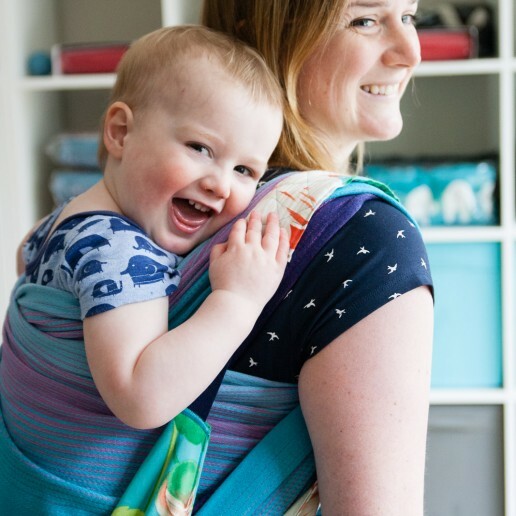 This is because woven wraps are a collection of individual strands and can be carefully tightened section by section to ensure your baby is fully supported from neck to kneepit, with the airway open, spine kept in the physiologically appropriate gentle curve and knees just gently apart to preserve healthy hip positioning. Such back carries are usually done high up on the parent’s back, so they are able to see their baby’s face and feel their breathing on the back of their neck. Most people will choose to do the simple rucksack carry, as the ruck pass doesn’t overspread the hips, and the single layer doesn’t drag fabric at an angle against the back. 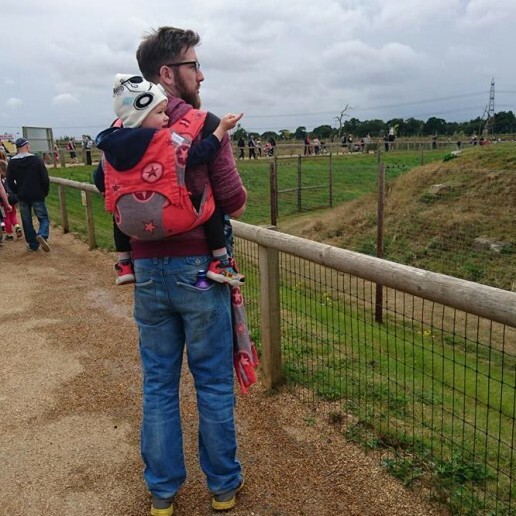 (Some babywearing schools will insist that this is the best carry to use for the first six months; other schools of thought are more flexible, but on the whole, ruck carries do work best for very young babies). Getting baby up onto the back can be a challenge; the Slingababy video below shows one way to do so safely. 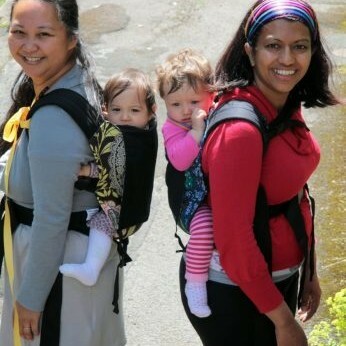 Some very mouldable mei tais (usually made of wrap fabric for the mouldability and control) can be used for back carrying young babies too. 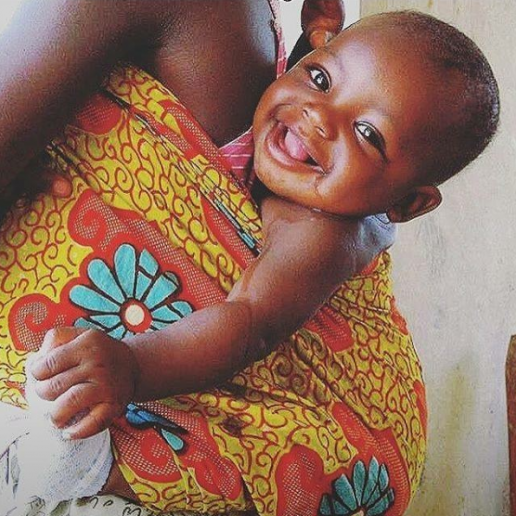 Older babies can be carried in wraps lower down, as in the African pictures above, as the fabric moulds around them properly. 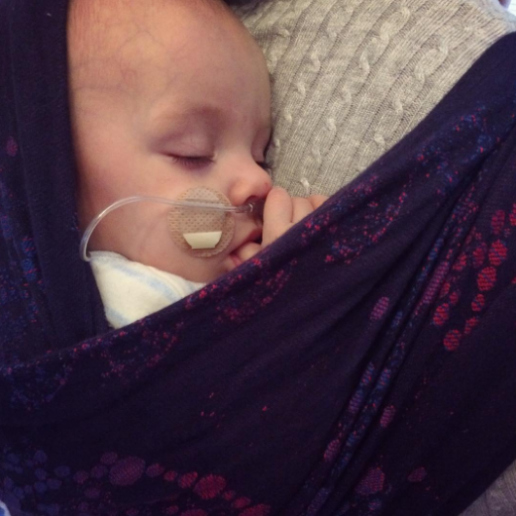 It is a common myth that all babies are best off in a high wrap back carry, or that they are safer; it is all in the positioning and skill to keep their airways open. Many parents find lower back carries can be more comfortable than higher ones, especially if they have back pain. It is worth trying a few carries out to see which works best for you and your baby. Videos from trusted sources can be useful, however, not every video on YouTube is a good one; some neglect basic safety checks, and not everyone finds videos an useful way to learn things. Your local sling professional should be able to support you! There are no real “rules”. “Rules” are often misunderstood/misinterpreted and can cause needless delay. It is worth noting that most structured carrier manufacturers will have guidelines regarding their use for different positions, and it would be wise to read these to ensure you are within warranty. Every parent needs to make their own decisions regarding when it becomes appropriate to back carry, weighing up their need/desire to back carry with considerations for safety and security. All carriers must provide enough support to prevent slumping and airway compromise. 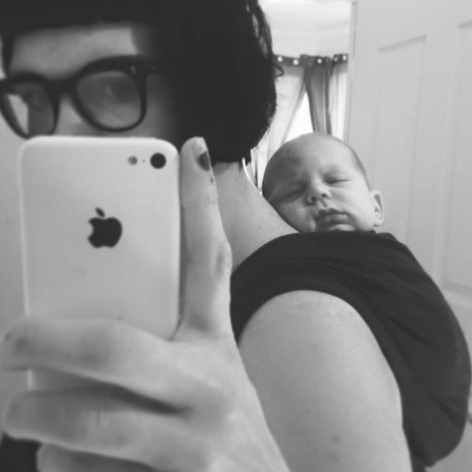 On the whole, most people feel that the best time to begin back carrying in structured panelled carriers (that may not mould in the same way as a wrap or floppy mei tai and are unable to provide neck support to heavy heads, and generally sit quite low down on the body rather than keeping babies high up near the parent’s neck) is when baby’s upper body and torso muscles are strong enough. They need to have enough endurance to be consistently able to support themselves and hold their heads upright for a significant amount of time without tiring. This typically occurs when babies are beginning to sit unaided (or nearly). This commonly happens around six months, on average – it varies from child to child. 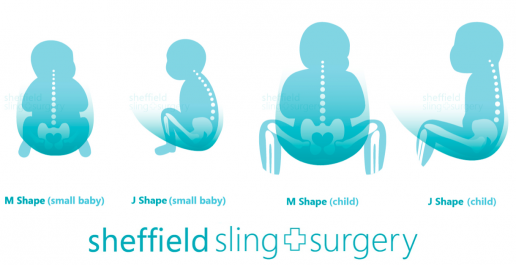 Some children may take longer to develop upper body control, but their parents may be struggling to carry them on the front; do go and see your local sling specialist who can help you find some solutions to this problem and keep you carrying. 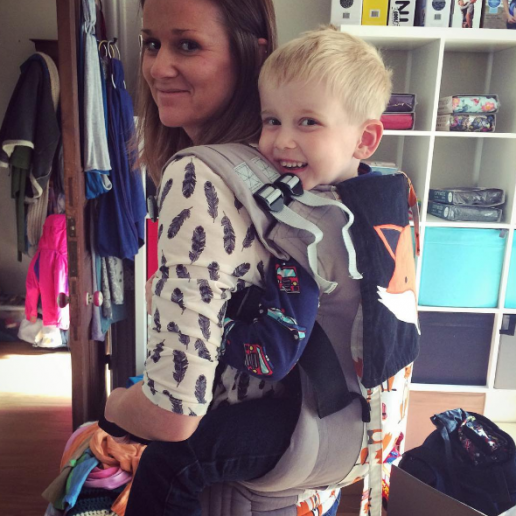 Generally, if the carrier fits your child properly and provides the necessary support, you can back carry in it. (This will apply to children with disabilities for example; it can take longer to gain head control but back carrying may be important. The right carrier that fits well and is used optimally may work just fine; do go and get some help!) 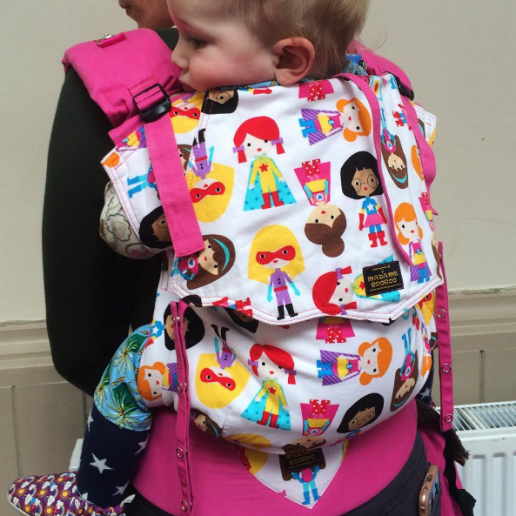 Read more about back carrying children with special needs here in a fantastic article about ableism in the babywearing community. Some parents will feel the need to back carry a little earlier, for example, parents of twins. The TwinGo carrier suggests that their carrier is suitable for babies of 4months plus, with “strong and consistent” head control. Of course, this control comes to some babies sooner than others, and factors such as the size of your baby and the width of the carrier may play a part in decision making, as well as the presence of other adults for support should your baby need some help. It is possible to monitor your young baby’s safety on your back with useful items such as mirrors, plus you can often add head and neck support using the hoods. Don’t be afraid to ask a professional for help! How can I get my baby on my back? This usually depends on the carrier you are using, and your levels of confidence, and the community you are part of. If you have grown up watching your family carry babies, it will feel like second nature – but if not, this is where getting advice and support can be so very useful. Back carries with buckles and meh dais are relatively straightforwards and there are many ways to do it. Some manufacturers will have very simple instructions (which may not always be the most easy to follow), and there are videos on YouTube. It is always best to look at videos with a critical eye to see how well it is done, and those made by trained professionals who are used to making videos are usually the most reliable. My back carry with buckle videos may be useful here – at no point is baby or carrier unsecured. Here is a link to my photo tutorial for the “walk like an Egyptian” method. The key thing is to know your carrier and know your child. Being familiar with the buckle placement or or how to tie knots/tighten webbing is important. If you have a willing child who will comply with back carrying, it will be easier to practice, however, if your child is very unwilling, it may be best to wait for another day. You may be able to distract your child with a small toy as you go, and mirrors are useful so they can still see your face if they are not used to seeing the back of your head and wonder where you have gone! Your local sling resources will be happy to teach you and this may be a very good way of rapidly improving your technique and confidence. 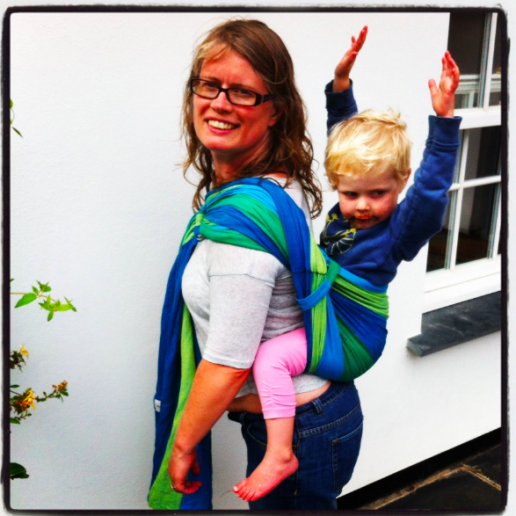 Back carries with a ring sling can be very useful, especially as the “seat” of the carry is created on the front or side of the parent, and then shifted around to the back. There is a knack to this, and also several ways to make the carry more secure and comfortable. Back carries with woven wraps can be more tricky, as the fabric needs to be tightened around the child bit by bit, and again, a willing child is a blessing for those learning how to do it. The age at which you start will influence your choice of method; most experts will suggest a bundled “santa toss” with the baby already secured in the pouch for newborns, as this is the most controlled and safe way. Of course this will depend on your previous experience. Older children (3months plus with hips opened enough to sit on the hip), can also be put on the back using the hip scoot. Over the shoulder “superman” tosses are popular, it is wise to ensure you are fully supporting your baby by their shoulders, rather than holding them only by their arms (which can put some pull strain on shoulder joints). 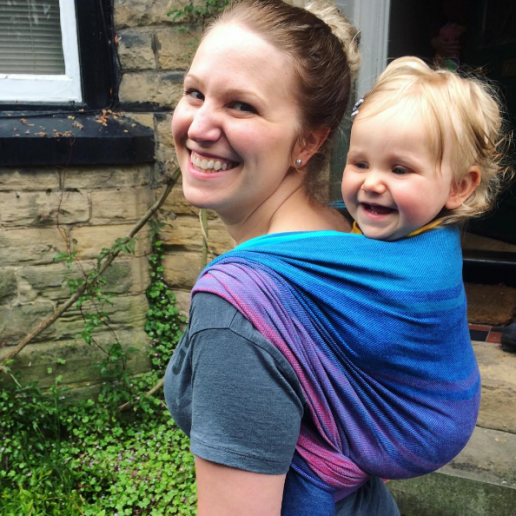 It takes practice to do it well – even seasoned babywearers who feel confident can find back carrying with a woven wrap a challenge, and none of us get it right every time – the “wrapping mojo” is real! I really do recommend seeing a professional to get some help and teaching if you are planning to back wrap a young baby, as there is a lot to get right. For example, the correct tension to support neck and airway for safe breathing, getting it snug all round to avoid baby slumping to one side or slipping down inside, and getting the right amounts of slack out at various points to ensure there isn’t too much tightness around the neck and the knees which can leave red marks. Some people do teach themselves to back carry with videos and manuals and with their peers, but there is no harm and much to be gained from trained support (just the same as getting support with breastfeeding, or learning to drive a car – an instructor will probably help you to be ready for your driving test sooner than a non-professional.) I have some videos here which I feel may be best as reminders. 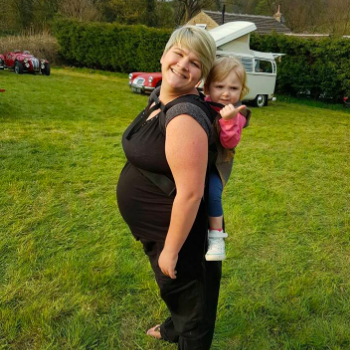 Back carries can be useful for pregnant mums, once the bump gets a bit too big for front carries, or if pelvic pain strikes, making hip carries hard (these are best limited if possible anyway, to avoid uneven loading of loosening ligaments). It is wise to build up your strength and tolerance for carrying as your body changes; little and often is key. In summary, back carrying can be great fun. It is challenging to do well, and takes practice, however, once mastered and done safely, it can be very satisfying, and for many, it adds a new lease of life to their carrying journey. I do urge you to seek the services of teachers to help if you are finding it hard, or uncomfortable – we are here to support you and empower you to keep on carrying! And don’t forget; sometimes front carries are just as lovely!